Dr Thomas is a consultant cardiologist at Barts Heart Centre, London, one of the largest cardiovascular centres in Europe. He has extensive experience in all aspects of adult cardiology including the assessment of patients presenting with symptoms of chest pain, shortness of breath, palpitations, dizzy spells and blackouts. He has a particular interest in advanced heart failure management including implantation of bi-ventricular pacemakers and cardiac defibrillators. He is also interested in cardiac risk assessment and prevention of cardiovascular disease. 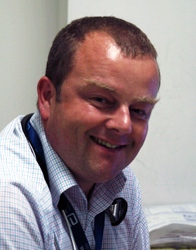 Dr Thomas has a specialist interest in aviation cardiology and is a consultant advisor to the Civil Aviation Authority. The satisfaction and wellbeing of his patients is at the core of all his work. Dr Thomas works closely with his patients to ensure their cardiovascular health. Each of his patients receives an individually tailored plan of treatment to address their medical needs and concerns. His private practice is located at London Medical in Marylebone and the Harley Street Clinic in London and at Spire Gatwick Park Hospital in Surrey. For more information or to make an appointment please call Dr. Thomas' secretary or leave your details and she will call you back.